Today was blood donors day. I have been giving for a while now, and so I thought nothing of yesterday. I was wrong. Anyway that went through, and so of I go to get onto my bed. It was my favourite helper there - a lady I got to know when I was working at M&S and she was a regular shopper. Anyway, as the nurse was putting the needle in and starting the flow, she caught it and it caught a nerve/ It was really sore - right down my arm to my fingers! I enarly jumped off the bed! The poor lady was so apologetic about it. She asked if I wanted to stop, and stayed there holding the needle because it was making the tiops of my fingers feel numb. She was lovely and could not have been more upset if it had happened to her! My heklper though was keeping an eye on me as well, so I was in good hands. Even the doctor is someone I know from the hospital! So in the end it took me longer to get back on my feet, and was not allowed to leave until I had drunk all my tea! I felt ok but was taking it easy. Thursday update - you should see the bruising on my arm! Yes I am back from my wanderings. I got back to the island on Saturday after over 2 weeks away - my longest trip this millenium! It was a mixed trip. It started of as a bit of a rush, as I had to go over early because dad had caught pneumonia, and mum was beside herself with worry. So after a day of rushing around - changing bookings, ordering prescriptions and making sure Pepsi was looked after, I got away. From York, I went to spend the weekend with my sister and her family. That was the usual slice of chaos, not helped by the fact that they are in the middle of a lot of work on the house! But it was a good weekend. One thing we did while I was there was go and see dad. He was lying in bed, not responding at all. If it had not been for the name on the door, it could have been a total stranger in there. It was horrible. So that is my mixed trip away. A thousand candles can be lighted from a single candle, yet the life of the candle is not shortened. Happiness is never decreased by being shared. 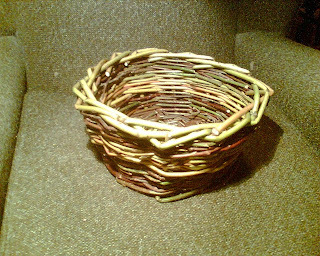 Yes it is official - I am a basket case! 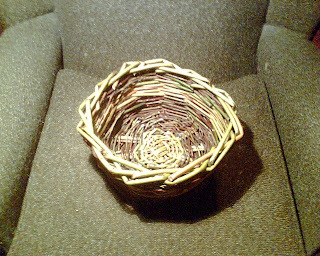 I spent a very enjoyable Saturday recently learning how to make woven baskets. And believe me, it is not as easy as it looks! There were 9 of us on the course, along with 2 instructors. It is a good thing there were not more, as the space required is quite considerable! As is the effort, with a lot of grunting going on as we pulled the willow into place. Indeed, if someone had been listening outside, they might have come to some very strange conclusions! And if they had come in, they would have found most of us on our knees, looking like some weird prayer meeting! But the end result, while lacking a certain professionalism, is still in one piece. The big test is how it will survive drying out, as that will shrink and loosen the willow. I have planted some offcuts of willow to see if they will grow - the soil is wet but the temperatures have dropped, so we will see! Oh - and here it is! and this is my work. here are my bad ones. some of them hate each other. the face only mirrors see. and my lack of love. Good ... better ... best! Garda traffic police had a perfect spot to watch for speeders, but were not catching many. Eventually, they discovered the problem – a 12 year old boy was standing up the road with a hand-painted sign which read ‘SPEED TRAP AHEAD’. The Garda also found his accomplice down the road with a sign reading ‘TIPS’ and a bucket full of money. A motorist was mailed a photo of his car speeding through an automatic speed trap, along with an 80 euro fine. Being cute, he sent the gardai a photo of 80 euros. The gardai responded with a mailed photo of handcuffs. A young woman was pulled over for speeding. As, the Traffic Corps Garda walked to her car window, flipping open his ticket book, she said ‘I bet you are going to sell me a ticket to the Garda Traffic Department Ball.” He replied “The Garda Traffic Department don’t have balls…” There was a moment of silence. He then closed his book, got back into his patrol car and left. Cummal Bane isn't me - it's the name of my house!